Do you wish to get married in a place away from your hometown? Do you wish to make your dream come true of getting hitched in an exotic location? 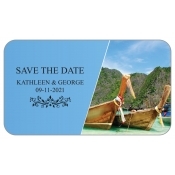 Feel free to indulge in these destination theme wedding save the date magnets because they will help you express your dream and get your guests prepared for the big day. 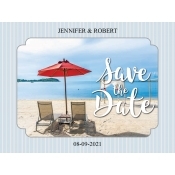 Featuring elements of surprise and clues, these save the date wedding magnets make the perfect pre-invitations for your much-awaited destination wedding. You can get these customized magnets shipped FREE anywhere within the contiguous USA. Destination weddings are in vogue because many new age couples are daring to leap out of their comfort zone and experiment with something new. With every traditional and themed wedding, invitations play an important role for a destination wedding, too. By sending these invites, you are not only announcing your wedding but also pumping interest in guests, who want to experience something new. You are politely telling them to keep their dates free and arrange for the travel. This time you can easily do it with personalized wedding save the date magnets. You need to include all essential information regarding date and venue in your invitation to inform your guests and ensure their participation. These save the date magnets are unlike the regular save the date cards of pre-invitations because they can easily set the mood for the occasion without any added efforts. 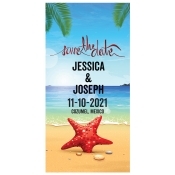 Full color destination themes save the date magnets are sure to grab big footage over refrigerator doors in the homes of your guests. They will see it every day and will be motivated to start preparing for the big day in style. It doesn’t matter to us whether you are planning to get married in pristine beaches of Belize, on the beautiful canals of Venice, gorgeous and luscious plantations of Bali, palaces of India, castles of Ireland, on anonymous tropical island or on the skyscrapers of New York, we can help you to achieve the perfect design. You can match these pre-invitations with your original invitation cards or whole theme of the event. If you already possess a design, feel free to share it with us at art@CMagnets.com or upload it at the end of order check out page. If you do not have an idea about your design or do not possess any artwork, we can help you by creating one from the scratch. You don’t need to go hunting for a suitable envelope to mail your guests because we offer a vast selection of customized/blank envelopes.